1. Crank the oven to 300° (150°C). Line a lipped baking sheet with foil and coat the foil lightly with cooking spray. 2. Whisk the egg white until very foamy. Add the sugar, salt, cumin, and red-pepper flakes and whisk well. Stir in the nuts and coat completely. 3. Spread the nuts in single layer on the baking sheet. Bake until they’re a deep golden brown, about 25 to 30 minutes, stirring often. 4. Remove the sheet from the oven and place it on a wire rack to cool. Break up any nutty clumps. The nuts be made a week in advance. (Ha! Like they’ll ever last that long.) Store in an airtight container. 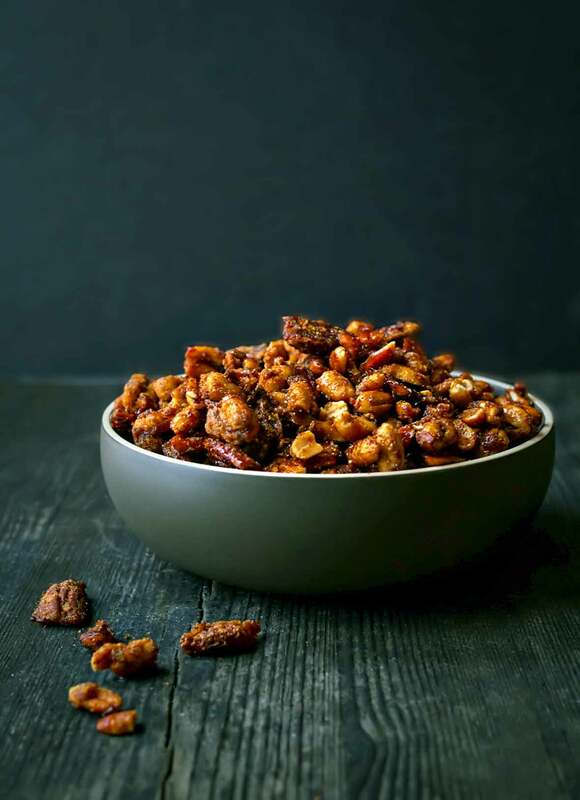 Sweet and Spicy Roasted Nuts Recipe © 2009 David Leite. Photo © 2013 Citrus and Candy. All rights reserved. All recipes and photos used with permission of the publisher.